Spain Euro 2016 Kit | New Home, Away Jersey: The Spain football team will be featured with the modern and different style kit in the upcoming Euro 2016. The new Adidas Spain Euro 2016 home and away kit features the modern style with stunning front pattern. Out of the ordinary design, the striking Spanish football has introduced with a unique front panel graphic pattern. Scroll down to get close look on Spain Euro 2016 Home & Away Jersey. The giant manufacturer Adidas introduces a classic design for the Spain team jersey for Euro Cup 2016. The Spain kit was debuted in the friendly game against England on 14th November 2015. The Spain new home Euro jersey introduced with a vibrant design with unique font panel graphic pattern. The home kit combines the famous colors of La Roja after introduced a striking gradient color design with two tones of red color. 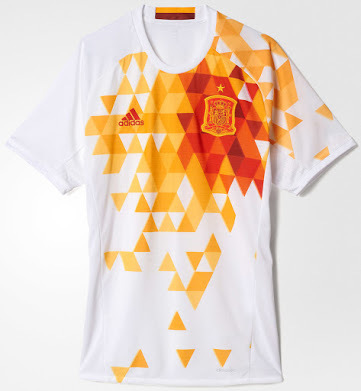 The v-collar Spain home shirt is introduced with a subtle triangular graphic pattern on the front, back and sleeves. 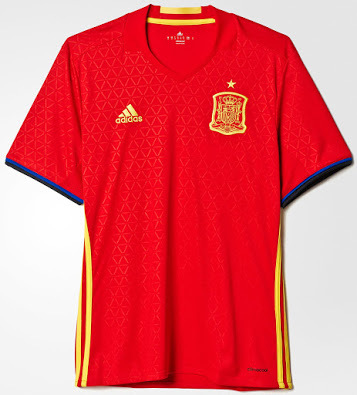 The iconic Adidas three stripes are not placed on the Spain Euro kit. Blue and black color are used for the sleeve cuffs. 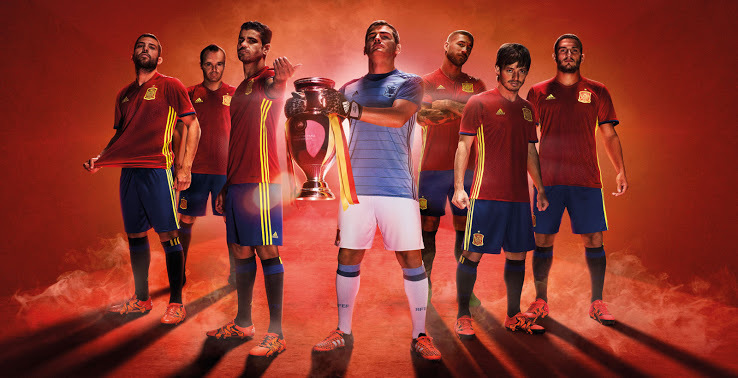 The royal blue shorts and dark navy socks completes the Spain Euro home kit. This combination was last used in the 1994 World Cup. 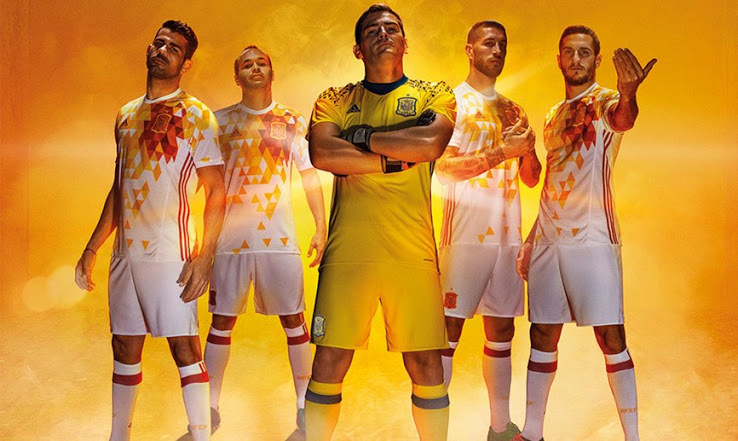 The Spain Euro away kit is vibrant design in white color with a stunning front pattern in red and yellow. The new away shirt has a white base with a unique triangular pattern print in different shades of red and yellow. The striking 3 stripes running down on each side of the shirt. Spanish flag details are visible on the inside and back of the collar. White socks and shorts with red Adidas stripes and logo complete the new classic away kit of Spain.